...exuberance, irreverence and dazzling virtuosity...Beneath all the fun and games there is a bedrock of terrific skill and timing...If you allow yourself to be carried along on the wave of all this inventive artistry, the disc will reveal hidden treasure. enjoyable dish of baroque pieces....all tossed off with impish élan. over-the-top but return from the other side with previously unimagined fun and delight. and jewels of the music of that era....beautifully evocative.... they are a tour de force.....this is pirate treasure indeed! Catch them in concert and on disc too; there’s no one quite like them. ‘Pirates of the Baroque’ is full of clever in-jokes for honest Baroque lovers. The whole recording is in some ways more 'authentic' than the lumpen versions of baroque music which used to be the norm. With forward recording to match the vitality of the performances, being boarded by these pirates is a Jolly Roger of an experience. Edward Teach, better known as Blackbeard, used to board ships with burning fuses woven into his beard; this is the musical equivalent. ...an irresistible collection of stylishly performed Baroque music. miserably to accomplish): attempting to cross the classics with modern sensibilities. created a true crossover recording. witty and anarchic fooling is never in doubt. to the spirit of baroque spectacle and Venetian skulduggery. Joneses of the Baroque ... consists of serious musicians who perform with great skill. above its qualities of novelty. hate ... Red Priest puts the viva in Vivaldi. that will be praised as visionary and heretical in the same breath….Good show! ...a sensational re-interpretation of Vivaldi’s popular masterpiece. Papageno in the Magic Flute. Over and above the humorous content the music-making is simply stunning. The tightness of ensemble, charm of their arrangements and the technically flawless Piers Adams on the recorders draw one in. Replete with hissing and catcalls, this disc is a chiller....musical brilliance. 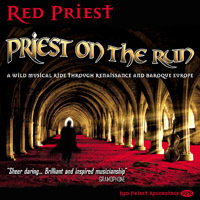 Sparkling and energetic versions of Vivaldi, Purcell and LeClair works...... if Red Priest is a musical dream for your ears, you might want to check out theirearlier CD, Priest on the Run. These players believe in bringing 21st-century sensibility to these old pieces, which in their hands don't seem nearly as ancient as we've come to accept. Ornaments are plentiful, extravagant expressions are common, and no one seems afraid to add a momentarily-felt improvisational enhancement. There are many more moments of surprise and "demonic" influence in this program-- but you'll have to experience them for yourself, because to describe them all would spoil the fun. With an impish sense of humour and astonishing virtuosity......there is a whole load of fun being had here, and a listener would have to be a most unresponsive character not to let out the odd gasp and guffaw...Red Priest also show they can engage at a deeper level; the Vivaldi in particular is movingly shaped. Daring and breathtaking virtuosity......not to be missed! Never a dull moment...admiration bordering on incredulity at the helter-skelter wizardry of the playing. sound...... spectacular tour de force..... some wonderfully intense showmanship that makes one proud to be British. 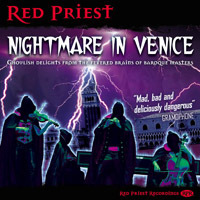 Red Priest's larger-than-life approach only enhances the music's energy and lets its spirit fly. Magnificent playing, too.